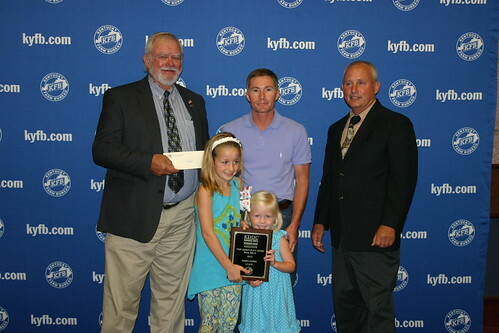 LOUISVILLE, Ky. — The Lee Robey family of Logan County won the Kentucky Dairy Production Award, and the Monroe Zimmerman family of Casey County earned the 2012 Kentucky Dairy Quality Award. 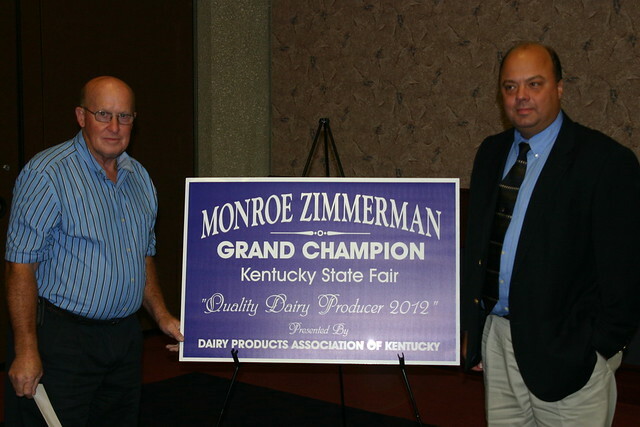 The Robey and Zimmerman farms were among those honored during the annual Dairy Recognition Dinner Aug. 17 at the Kentucky Exposition Center in Louisville. The Kentucky Dairy Quality Award is judged on industry quality standards and farm inspections. The Zimmerman farm received a monetary award and a farm-gate sign. Other finalists were the Tony Compton family of Adair County and the Eddie Gibson family of Kenton County. The Robey farm took top prize in the Kentucky Dairy Production Award – All Herds competition for the third time. It achieved a rolling herd average (the average weight of milk a herd produces in one year) of more than 27,000 pounds. Top Herd Production – Mixed Herd was won by the Rowe Farm, Billy and Freddie Rowe of Adair County. The Proficient Dairy Producer Award was won by the Eastern Kentucky University farm of Madison County. The Proficiency Award is given on the basis of several factors as recorded by the Dairy Herd Improvement Association. District winners for the production award were Howard Yoder, Christian County; Sam Coblentz, Todd County; Brian Peden, Barren County; Fowler Branstetter Farm, Metcalfe County; Corbin Brothers Dairy, Taylor County; Steve Young, Clinton County; Darrel Horst, Lincoln County; UK Coldstream Farm, Fayette County; Spring Hill Farm, Carter County; Eddie Klingenfus, Shelby County; Tri-Mast Dairy, Marion County; and Aubin Mattingly, Hardin County. The production awards were sponsored by the Kentucky Dairy Development Council and Kentucky Farm Bureau. The third annual Kentucky Quality Milk Hauler Award went to Willie Brown of Somerset. Nominees were evaluated on activities that have contributed to the quality of their work and the positive image that they portray for the dairy industry. The Milk Safety Branch presented Outstanding Dairy Producer Awards to Kaye and Louis Shipp of Taylor County and Bob and Angie Klingenfus of Oldham County. Community service awards went to Kenny’s Farmhouse Cheese of Barren County, Prairie Farms of Pulaski County, and Dean Foods of Jefferson County. The Dairy Promotion Award went to Billy Travis of Caldwell County and Larry Jaggers of Hardin County. The Culinary Award went to Jean Kemper of Shelby County. The dairy service award was presented to Bob Bowen of Bowen Sales, Louden, Tenn.
More than 180 dairy producers and industry representatives from throughout the Commonwealth attended the dinner, which honors the individuals and groups that produce, process and promote Kentucky’s high-quality dairy products. The dinner and awards were sponsored in part by individual dairy plants and cooperatives, the Dairy Products Association of Kentucky, the Kentucky Dairy Development Council, Kentucky Farm Bureau, the Southeast United Dairy Industry Association, and the Kentucky Department of Agriculture.